After a nationwide search, Cristo Rey Richmond High School, a new college-preparatory high school for underserved students in Richmond, announced the appointment of Peter J. McCourt as founding President. Pete comes to Cristo Rey Richmond from Bon Secours Richmond Health System, where in his eleven-year tenure he served in various leadership roles within the Mission Services Division. Most recently, he served as the Vice President for Mission of the Bon Secours Virginia Medical Group. He is active in pastoral ministry in the Catholic Diocese of Richmond and is a Candidate for Ordination to the Diaconate this year. Pete will begin his tenure at Cristo Rey Richmond on January 15, 2018. 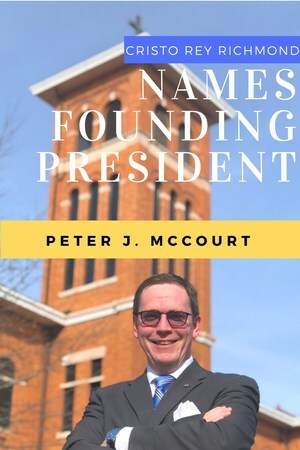 McCourt holds a master's degree in theology from the Washington Theological Union in Washington, D.C. and has completed post-graduate studies in theology and in leadership at the University of Notre Dame. Cristo Rey Richmond is a private independent college preparatory Catholic high school that will educate young people of limited economic means to become men and women of faith, purpose and service. Through a rigorous college preparatory curriculum, integrated with a unique work study experience, students graduate ready to succeed in college and in life. It is part of a national network of 32 schools founded in Chicago in 1996. Cristo Rey Richmond has moved into the former Benedictine High School building on Sheppard Street in Richmond’s Museum District. Students are scheduled to arrive on campus in the summer of 2019 with a projected freshman class of 100 young women and men. A new class will be added each year towards a full capacity of 400 students by fall 2023.